Indestructible Hulk by Mark Waid: The Complete Collection review: infuses the slobber-knocker throwdowns with solid story – AiPT! Hulk: The strongest there is. Banner: The smartest man alive. Combined, they are indestructible! Good thing they’re on S.H.I.E.L.D.’s side! When I hear the name Mark Waid, I immediately smile and think back to the first time I read Kingdom Come. What an epic story, and Alex Ross’ illustrations… wow. All around, Kingdom Come, in my humble opinion, is pretty darn close to being perfect. Why am I bringing up a DC title in a Marvel review? Well, I want to make it clear to you, dear reader, that I immediately associate Waid with Kingdom Come, and thus, judge his work by comparing it to the epic DC title that I am oh so fond of. But, now that I got that out of the way, let’s get on with the review. Indestructible Hulk by Mark Waid: The Complete Collection collects Indestructible Hulk #1-20 and Annual #1. To put it simply, Mark Waid’s Indestructible Hulk is damn good. Typically, in Hulk comics, or any comics where the Hulk is part of the team, Bruce Banner finds himself turning green to take on a big baddie that’s far too strong for any other hero to battle. I like seeing the Hulk kick the snot out of giants and big ol’ beasts as much as the next guy, but before long, too much of any good thing gets old. Thankfully, in Indestructible Hulk by Mark Waid: The Complete Collection this doesn’t happen because Waid infuses the slobber-knockers that ensue between the pages of this collection with some solid story. Bruce Banner, throughout the collection, has his own needs, wants, and desires and Waid makes them quite apparent. Doing this, of course, makes Banner seem/feel much more human than is typical. 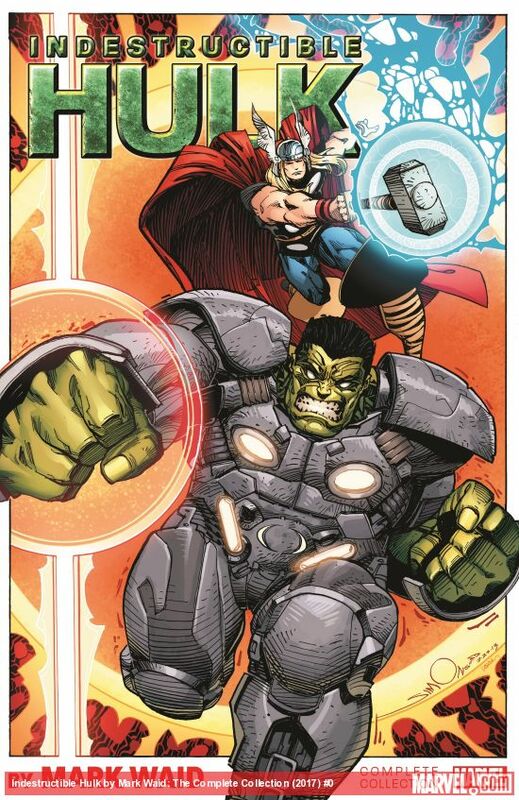 In addition to this, the book is filled with some fantastic moments, like when the Hulk manages to lift Thor’s hammer and then calls out that he’s worthy. From the beginning, through to the end, Indestructible Hulk by Mark Waid: The Complete Collection is very entertaining. One of the most interesting aspects of this collection is that there is a single writer, Waid, working alongside/teaming up with a slew of very talented artists whose styles differ greatly. Having various artists work on a single title not only (in this case at least) provides readers with a pleasant change from issue to issue, it also works to highlight the author’s consistency and high-level quality of work. Despite the (welcomed) changes in the art department, the series retains its essence and its feel. In closing, Indestructible Hulk by Mark Waid: The Complete Collection is an epic read for sure. For Hulk fans, buying this collection would mean money well spent. Pick this one up folks, you won’t be dissatisfied. Indestructible Hulk by Mark Waid: The Complete Collection is an epic, well-written, and well-illustrated collection that any self-loving Hulk fan should pick up. Highly entertaining and packed with awesome moments, this collection is one that shouldn't be missed.